Presently there are many thousands of ant species living on the Earth. That too, many of the ant species live in the rain forests. Like human beings, ants also live in large groups as social animals. Based on the place and species, each group has ants in the order of some lakhs. 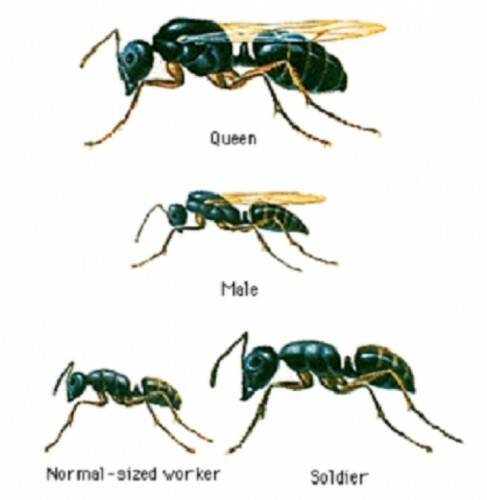 In every group, there will be a queen ant, worker ants, soldier ants and male ants. From the fertilization of eggs through male and female sperm cells, first three types of ants in a group are born and from the unfertilized eggs, male ants will be born. Each ant has its own way of living and working style. Each group has more number of worker ants than other types of ants. These ants are the daughters of queen ant actually. But these worker ants do not have wings and do not have capacity of reproduction like their mother. Their work is to collecting, supplying the food to the other ants in the group, protecting the living place and extending the ant hill. They lead their life in this way by doing all these works. Soldier ants are also female ones without the ability of reproduction like worker ants. But these ants are different from them. These ants attack ant hills and bring those ants as slaves into the group. Male ants are small in size and they also have wings. But these ants die with in short time after participating in the reproduction process with the queen ant. After coupling the male one or ones, queen ant flies to its residence with the help of wings. Then it loses its wings and lays eggs continuously throughout the rest of life till the death.